Readers looking for NYSE news are finding an Oops! on WSJ.com. Trading was halted on the New York Stock Exchange just after 11:30 a.m. ET, and the timing could not have been worse for WSJ.com. 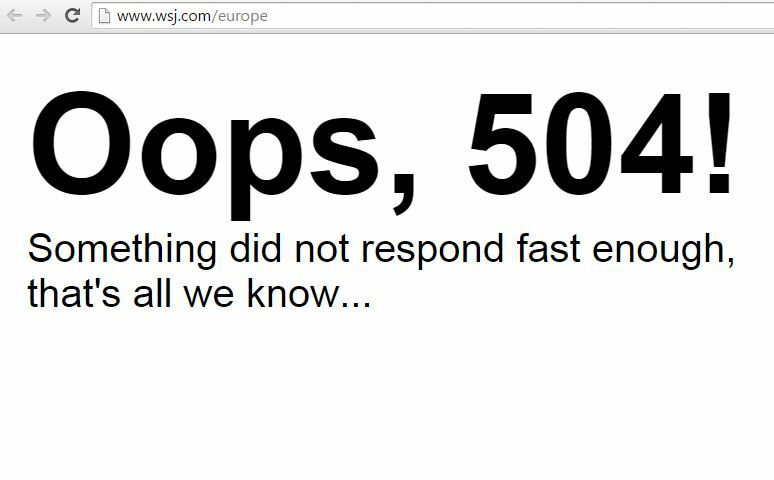 Not long after reports of the NYSE technical difficulties began to surface on Twitter, The Wall Street Journal’s homepage turned up a 504. Article pages are loading. The story about the NYSE halt reads, “A technical glitch was registered ahead of the U.S. stock market’s open but was apparently resolved before shares began trading at 9:30 a.m.
WSJ.com began coming back online for some users around 12:08, but was directed through wsj.com/europe. The mobile app is accessible. We’ve reached out to Dow Jones for comment. Update: A message here reads: WSJ.com is having technical difficulties. The full site will return shortly.